For a quarter century, the U.S. PIRG Education Fund (U.S. PIRG) has educated the public about toy safety for the holiday shopping season. Toys With Dangerous Lead Limits. Lead has been banned in paint, children’s products and cookware in the United States since 1978, but it remains a problem in toys which are imported from other countries. Between October 2010 and November 2011, nearly 200,000 toys were recalled because of excessive lead limits, U.S. PIRG reported. This year’s U.S. PIRG review found two toys on the market with lead levels which exceed the current 300 ppm standard, one toy that exceeded the prospective 100 ppm standard and four toys that exceeded the American Academy of Pediatrics recommendation of 40 ppm. This is the limit supported by U.S. PIRG. Phthalates in Toys. Exposure to phthalates has been linked to have adverse health effects for children in the womb, including premature delivery and reproductive defects. 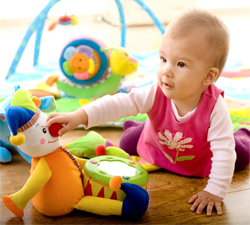 U.S. PIRG identified two toys with limits exceeding the amount allowed by the Consumer Product Safety Improvement Act of 2008. The two toys include the Funny Glasses, manufactured by Joking Around, and the Sleep Mask, manufactured by Claire’s. Both exceed the 1000 ppm of banned phthalate standard. Cadmium. Cadmium is a frequent additive in children’s jewelry. In response to a legal action in September, retailers agreed to sell only products that have less than 300 ppm cadmium. U.S. PIRG found no cases of noncompliance, but urged the Consumer Product Safety Commission to proceed with setting limits for cadmium in children and toy jewelry. Choking Hazard. Choking on toys with small parts is the leading cause of toy-related deaths and injuries. Between 1990 and 2010, over 200 children in the United States died from choking. Toy makers face complex regulations for testing and labeling their products. U.S. PIRG found several violations, including toys with no warning labels indicating they included small parts. The group called on the Consumer Product Safety Commission to take actions such as enlarging the small parts test tube size. Loud Toys. U.S. PIRG reported several toys on the market exceed the ASTM 2003 standards for sound-producing toys, including Elmo’s World, Talking Cell Phone, manufactured by Fisher-Price; Victorious Stereo Headphones, manufactured by Nickelodeon; and Hotwheels, Super Stunt RAT BOMB, manufactured by Hotwheels. Shop wisely. If you have small children in the house, avoid toys for your older children which might represent choking hazards for your younger children. Avoid products which are obviously intended to generate loud noises or which may have headphones that cannot be turned down. Common sense says look for toys that have been on the market for more than a year because they are more likely to have been tested and proven safe. Buy toys that will promote physical activities to help your children stay strong and healthy. To read the full U.S. PIRG “Trouble In Toyland: The 26th Annual Survey of Toy Safety,” click here. The Boston product liability lawyers at Breakstone, White & Gluck are experienced in handling cases involving defective products, product recalls and defective medical devices. If you have been injured as the result of a product, it is important to learn your legal rights. Contact us today for a free legal consultation at 800-379-1244 or 617-723-7676 or use our contact form.